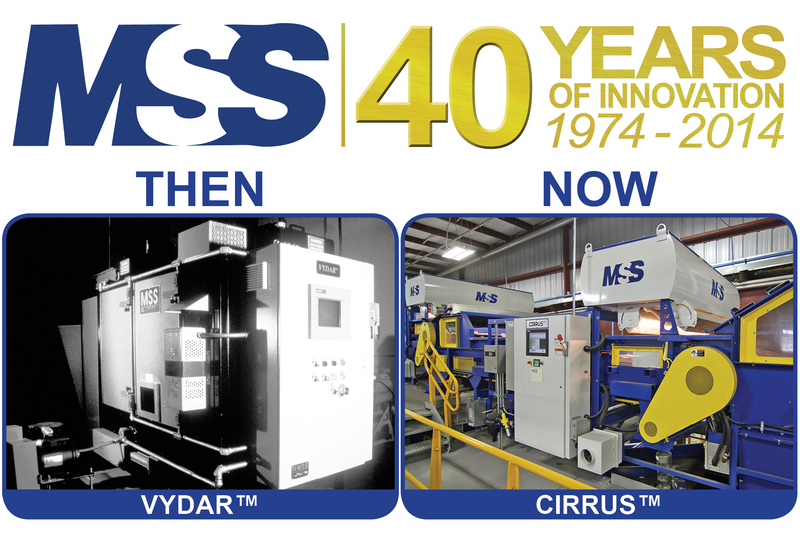 MSS Celebrates 40 Years of Innovation | MSS, Inc.
MSS, Inc., Nashville, TN celebrates 40 years of developing and manufacturing optical sorting technologies, several of which are still commonly used in today’s material recovery facilities. The company was founded in 1974 by physicists Garry Kenny. In 1976, MSS released the first commercially successful eddy-current separator, the PULSORT™, used to separate non-ferrous materials such as aluminum cans from municipal waste. Subsequent products included the BottleSort® for plastic bottle resin and color sorting, and the PaperSort™, the first commercially available optical paper sorter. Over the next four decades, MSS continued to optimize their equipment. The latest high-resolution sensors include the CIRRUS™ for near infrared material sorting, the L-VIS™ for color and shape separation, and the MetalSort™ for separating metals. For over 40 years MSS, Inc has been a world leader in automated optical sorting systems for plastics, paper, glass, metals, wood, electronic scrap, and more. MSS is a division of the CP Group, a world leader in engineering, manufacturing and installing Material Recovery Facilities for Single Stream Recycling, Construction and Demolition Recycling, Municipal Solid Waste recycling, Commercial and Industrial recycling, Front-End Waste to Energy systems, eWaste recycling, and more.